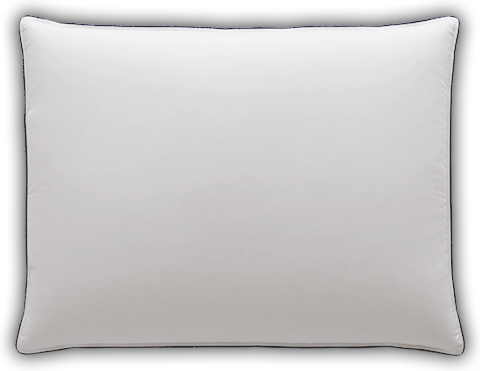 Snuggle in for a great night’s sleep with our firm support Classic pillow featuring fluffy premium down covered in cotton sateen giving you inviting softness inside and out. These pillows are perfect... and I'm fussy! I look forward to sinking into their luxurious softness every night. I have 4 for just my bed and they are well worth the price! If you are a side sleeper or need extra support for your head and neck treat yourself to our Pacific Coast® Classic firm support pillow. This inviting pillow holds just the right amount of 550 fill power Hyperclean® down to give you a fluffy, high sink experience. With an increased amount of fill over our soft and medium design types, you get that firm cushioning you need for a great night’s sleep. You can enjoy this traditional pillow for a long time thanks to the 500 thread count, 100% cotton sateen with its incredibly silky feel. Our Pacific Coast® Classic firm support pillow is finished with navy blue printed cording and can be washed and dried in your machine as needed.